China was the only country which Rahul Gandhi, President of the Indian National Congress (INC), mentioned in his concluding speech at the 84th, plenary session of the party in New Delhi last Saturday. And even that was in connection with his overall plan to revive India’s declining industrial sector. But the significance was not so much in the mentioning of China to the exclusion of other countries, but in the brief outlining of the challenge posed by China to India’s domestic industries (including small and medium industries which are the biggest employers in the industrial sector), and of his way of meeting the Chinese challenge, writes P.K.Balachandran in South Asian Monitor. 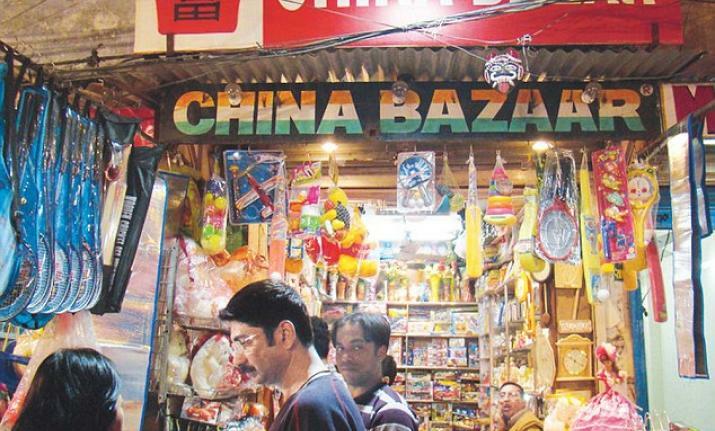 “You go to any Indian market, take any product and look at the other side (to see the place of manufacture), it will be China,China, China!” Rahul said. He then went on to point out that rich Indian businessmen are minting money by importing Chinese goods while Indian manufacturers are starved of bank loans and burdened with Goods and Service Tax (GST) whose rates are the highest in the world. Significantly, a Chinese Communist Party representative was among the guests at the plenary. Carving out a place for India in the world order, Rahul said that the world today has before it two alternative economic and governance models to emulate – the American and the Chinese. But there is scope for a third model, the Indian model, which is at once growth oriented and democratic, he said. The Congress will develop this model for the world to follow, Rahul added. The plenary was attended by strong contingents from abroad. The Awami League of Bangladesh, African National Congress (ANC) of South Africa, and the United National Party of Sri Lanka sent significant delegations. The Nepali Congress, which was defeated in last year’s general election, was represented by a large delegation led by former Nepalese envoy Deep Kumar Upadhyay. The Chinese Communist Party sent a member delegate. In contrast to the ruling Bharatiya Janata Party (BJP), which has not brought about investment despite its ‘Make in India’ slogan, a Congress government will generate employment by encouraging small and medium industries to come up at the district level, Rahul said. These industries will use locally available talent and resources and bank credit for them will be ensured. He promised loan waiver for farmers burdened by debt, which has led to 2500 suicides to date. “Food parks” will be set up in every district where farmers can bring their perishable produce, get guaranteed prices and have their produce processed to enhance their shelf life. Flush with successes in by-elections in the politically significant Hindi-Hindutwa heartland in North India,namely, Uttar Pradesh, Bihar, Rajasthan and Madhya Pradesh, Rahul unveiled an ambitious plan to oust the BJP from power in the next parliamentary elections in May 2019. Congress,he said, would strive for communal and caste tolerance and coexistence and eschew the BJP’s policy of sharpening religious divisions and promoting communal hatred to win elections and keep itself in power. The lynching of Muslims for eating beef or selling cows for slaughter had become commonplace in the North Indian States ruled by the BJP. There are attempts by the BJP’s ideological wing, the Rashtriya Swayamsewak Sangh (RSS), to infiltrate all institutions, especially educational and research institutions to change the mental makeup of Indians to wean them away from their historical legacy of tolerance. The Congress, on the contrary, would respect all faiths and ideologies and not criminalize disparate thinking,Rahul said. Explaining his visits to Hindu temples in Gujarat during the last State Assembly elections, which critics said were a fake show of devotion to Hinduism to wean away Hindu votes from the BJP, Rahul said that he had been going to Hindu temples in the past too. But he had also visited mosques and churches, as he believes that God is everywhere. India belongs to all, irrespective of religion or caste, he added. Unlike the BJP under Modi, theCongress will fulfill its promises, Rahul said. Modi had promised the earth, one of his promises being that the billions of dollars of black money stacked away abroad would be unearthed and brought back to India, and INR 15 lakh would be put into every Indian’s bank account. But nothing of this kind has happened. On the contrary, Modi’s draconian GST with the highest rates in the world, coupled with his demonetization of 85% of the currency hit trade, investment and employment. The Congress President pointed out that instead of fulfilling his promises to the people, Modi is rubbing shoulders with corrupt corny capitalists like Nirav Modi. Rahul promised that the Congress will honor its commitments to the people. And if mistakes are made, it will apologize publicly, unlike Modi and the BJP, which are too arrogant to do so. While unemployment and farmers’ distress have become India’s most pressing problems, Modi tries to divert attention from them by launching fancy programs unrelated to the needs of the people,such as performing yoga in public places, Rahul charged. Rahul said that the Congress will be led by the youth. The wall dividing the leaders from the workers will be broken down. But this will be done without alienating the senior leaders from whom there is a lot the young can learn, he added. Symbolizing the new party structure, Rahul did away with the practice of having all the top leaders siton the dais, while the workers squat below. The dais was empty but for a podium for the speaker. Rahul said that he hoped that soon, the empty stage will be filledby talented youth from every part of India.He promised that from now on,work done for the party and not spending power will be the criterion for giving party nominations in elections. 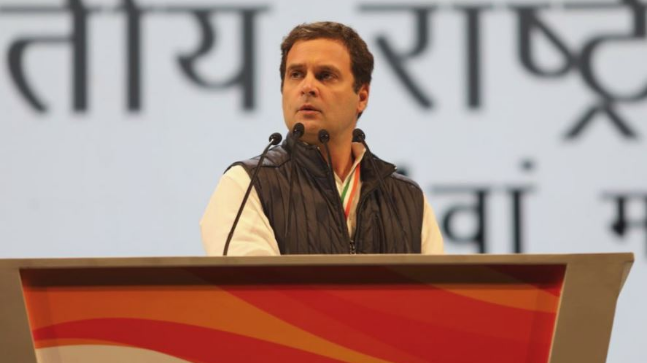 Urging party cadres to get into electoral battles with courage and not be intimidated by an aggressive BJP, Rahul said that the Congress party is known for showing courage in the face of adversity. Thousands upon thousands led by Mahanta Gandhi, had gone to jail during the independence movement while V.D.Savarkar, an icon of the BJP, was pleading with the British to release him from jail, he recalled. The BJP may have a large army of workers and flush with money too, as compared to the Congress, but the Congress will overcome the BJP because it is fighting for truth and justice against arrogance of the BJP, much like the principled Pandavas defeated the mighty and haughty Kauravas in the epic battle of Kurukshetra, not far from the venue of the conference venue, Rahul said. In the context of the killing of liberal and secular journalists like Gauri Lankesh, Rahul said that the Congress will give the media the fullest freedom and that whenever the media is harassed, the Congress will rush to its aid. Itremains to be seen if Rahul will be able to implement his ambitious schemes to defeat the BJP. Time is short as the Big Match is only 14 months away.